The iDevices Socket is an adapter that goes between your lighting fixture and a standard bulb to add Wi-Fi and iPhone app control to any lightbulb. It also adds support for control via Siri voice commands and the iOS 10 Home app through Apple’s HomeKit platform. Installing the product only takes a few minutes. You screw it into your lighting fixture as you would a lightbulb, then screw your lightbulb into the iDevices Socket. Once screwed in, the companion iOS app called “iDevices Connected” runs you through a quick setup to connect to your Wi-Fi network and give your Socket and its built-in night light a nickname (I chose “desk lamp” and “night light”). 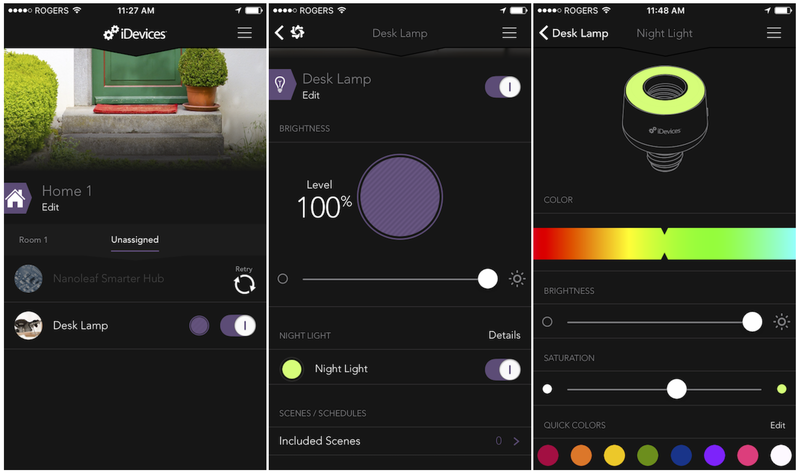 After you’re connected, the app will let you switch your bulb on and off and adjust its brightness if your bulb supports dimming. The Socket also has a built-in LED night light that acts independent of your connected bulb (pictured around the base of the bulb in purple above). It appears as a separate accessory within the app and HomeKit, and you can adjust the color and brightness of the night light or optionally disable it from within the app. The manual switch on the Socket doesn’t affect the night light at all. With HomeKit support, the app lets you see and set up Scenes, Rooms, Zones, Apple’s features for grouping together accessories for organization and to control multiple actions with a single command. The app also just gained support for controlling your accessories with voice commands via Amazon Alexa hardware. Floodlights, spotlights, or vintage and decorative Edison-style bulbs are a few examples of traditional bulbs you might want to add iPhone-control and HomeKit support to using Socket. It’s a decent alternative to the Philips Hue style approach if you want to control a small number of lighting fixtures, or for those that use speciality bulbs that they can’t get with a platform like Hue that’s tied to proprietary bulbs. The relatively chunky Socket, however, doesn’t exactly enhance the look of your bulbs if you’re using an exposed, decorative bulb like an Edison-bulb. It would be a lot easier to recommend the Socket if it were less expensive. At $80, you can currently get a Philips Hue kit with a bridge and two bulbs for the same price. Plus with the iDevices Socket you have to bring your own bulbs, but that’s actually the one reason why the product might appeal to some as noted above. If you want to add HomeKit control to a single lamp, spotlight, or other lighting fixture with a bulb of your choice, Socket is one of the more feature-filled options. An alternative would be an outlet with HomeKit support like the iHome SmartPlug (our review) or the iDevices Switch, giving you on and off support on single device for around half the price. Get the iDevices Socket for $79.